It’s time once again to find out what the courier delivered from Degustabox! This month’s box wasn’t very heavy, and the contents didn’t take up a lot of space, but there were plenty of sweet Easter treats, as well as drinks to keep you going past Easter, too! Our family has been busy over the past week trying out all of the Easter Degustabox goodies and it’s time to share them with you! 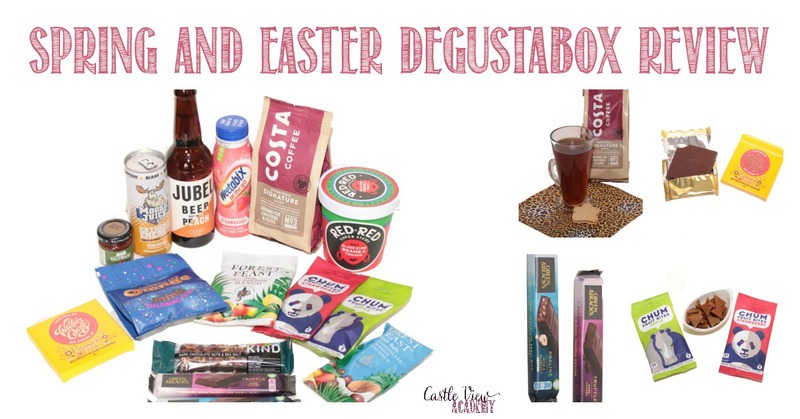 Let’s start with the contents of the March Degustabox before moving on to our top picks. Each monthly box contains between 10-15 products; some aren’t yet available in the shops which gives you the first chance to try them out! The short version of this month’s box is that there are 14 items; 8 snacks, 4 beverages, and 2 meal items. 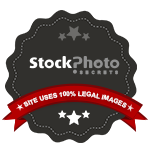 The long version is…. Each month we feature our top picks in the box. Of course, these choices are based on our own tastes, and I’d love to hear what your favourites are, just pop them down in the comments at the end of this post. My top pick were the Green & Black’s bars. I do like a good praline, and I was not disappointed. The dark chocolate shell greeted me with a softer centre dotted with pralines. I was going to save half for Phil to try…but it was just too tempting sitting on the counter! The two of us did share the Truffle bar for dessert on date night, however. Yum! Phil couldn’t wait to try out Costa’s Signature Blend Coffee. His coffee press had a little accident not long ago (there should be a replacement arriving in the next day or two), so he made due by using one of the kids’ craft coffee filters in a teapot to brew a cup for us. It didn’t give him heartburn, so he was happy having it just black. I also liked it, but may add a dash of Bailey’s to it for something a little different. READ 10 Things To Spring Clean- That You May Not Think About! Phil was also taken by KIND Snacks Dark Chocolate Nuts & Sea Salt bar. It’s hard and crunchy, packed full of peanuts coated in honey to hold them together, and bound by a layer of dark chocolate for the base. Because of the dark chocolate, it’s not too sweet, and there’s a light touch of salt that melds well with the peanuts. Kallista’s favourite item this month was the Forest Feast Preda Fair Trade Dried Mango. I knew she would like these as we have previously made dried mango sliced dipped in chocolate that she wants to make again. Tristan has chosen to go with Chum Fruit Bites, that come in both strawberry and apple. These are little triangles of fruit leather, very similar to what my mom makes back home in the autumn. They are simply fruit purée dehydrated and sliced into bite-sized pieces. They would make a great travel snack for both kids and adults. 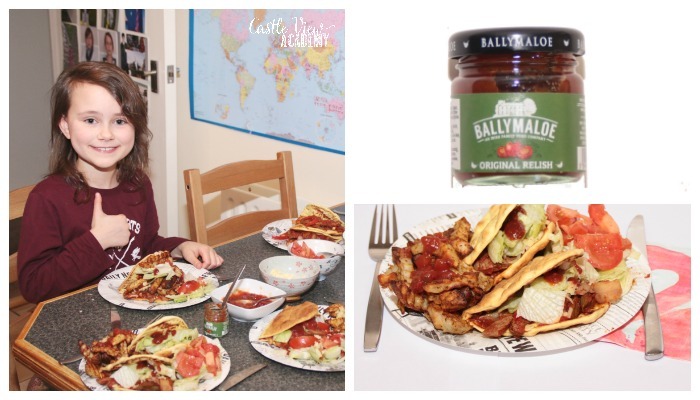 Dare I say that the children also enjoyed the Ballymaloe original relish? They tried it out on their beef fajiitas and the sample-sized jar was almost gone by the end of the meal. It’s sweet, and smooth, unlike the tangy, chunky relishes I’ve had before. I do like chocolate, and I would rather now spend a little more and feel like I’m indulging rather than just getting something cheap off the shelf. Willie’s Cacao Single Estate Chocolate has that indulgent feeling contained within the gold inner wrapper. The chocolate is smooth and melts in your mouth, with a little punch of passion fruit flavour that definitely adds interest and depth. Jubel Alpine beer cut with peach was a surprise to find, after asking a friend just last weekend if there were fruit infused beers available as I missed a couple from Canada. And now I had one of my own (sharing a taste with Phil, of course). It was light in colour and taste, with a slight bubbly peachy aftertaste. It was a little different than I was expecting, but it grew on me. As an added bonus to review in our box this month was Terry’s Chocolate Orange Mini’s with Popping Candy. The regular version is one of Phil’s favourite’s so I knew he would love these, and indeed he did! Chocolatey, refreshing orange, and the sound of your brain popping – what’s not to like? And these are bite-sized so you can devour an entire slice at once…or more if you want to! As I sit and type away on the laptop and the children are outside burning off some energy, Phil’s having a lazy weekend and so I thought he could try out Red Red Super Stew’s Black Eyed Beans & Tomato variety. It cooked up thick and saucy, and the white and black beans with the red sauce was quite colourful. It wasn’t too bad, but not quite to my everyday liking. Phil didn’t mind, though, as that meant he could have the whole pot to himself! Phil drank the Strawberry Weetabix On The Go for his mid-morning break at work after cycling 15 miles that morning. Breakfast drinks aren’t usually on our grocery list, but Phil said he does occasionally enjoy them for something different if he’s too busy to stop for breakfast at work. 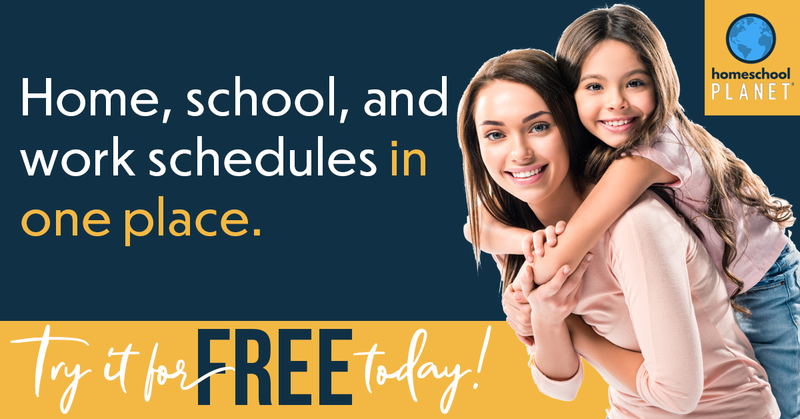 It’s no secret that we are always busy here with something going on in one area of life or another, and the afternoons can be tough, especially nearing the end of the week. I tried the passion fruit Moose Juice on Friday after a big session of photo taking and dish washing. It says there is zero sugar, as well as no aspertame, which is good as I stay away from that. There are, however, other artificial sweeteners in it, and I found it has a similar after-taste, so I’m not the biggest of fans. I do like that there are B vitamins in it, as I have found those helped me get through the winter this year. This product isn’t one that I will seek out in the shops. There’s enough in this little box to keep everyone going, and it offers some good ideas for the Easter Bunny to note! There you have it! 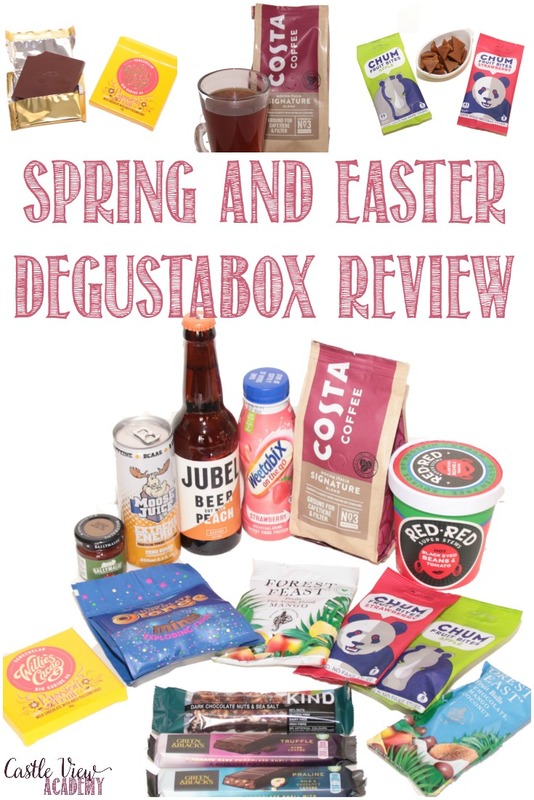 The full run-down of the Easter Degustabox for 2019 – the ups and downs and in-betweens. 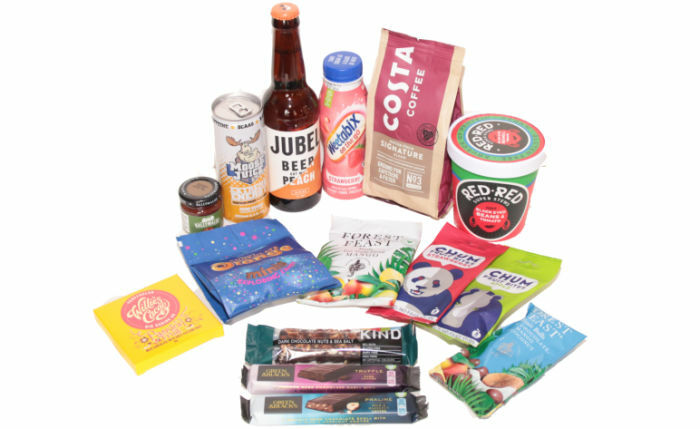 Have you tried a Degustabox yet? 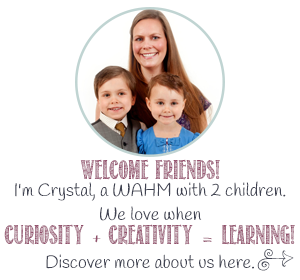 Give it a whirl and see what delights are in the next box! UK website, UK Facebook, UK Twitter, or UK Instagram.